Note: In memory of Yankee Legend Yogi Berra, the beloved 20th century American sports icon who we lost Tuesday night, a replay of a past post. It’s deja vu all over again. What mid-century boy wouldn’t love having his photo hanging in an all-star’s locker? “Kids! 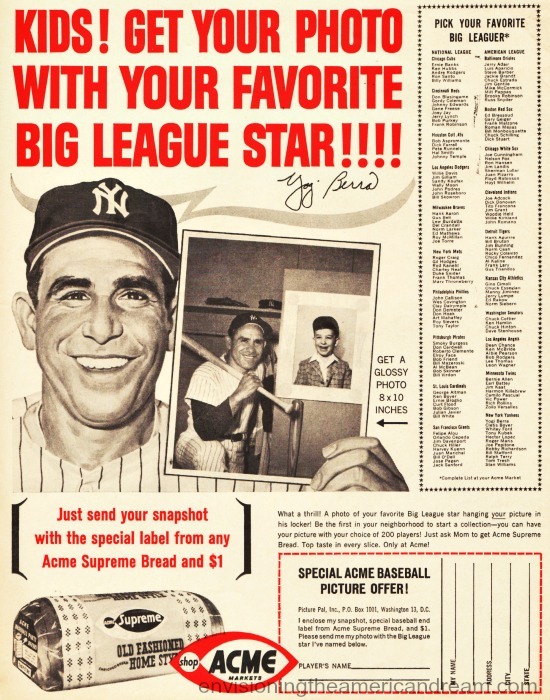 Get your photo with your favorite Big League Star,” grinning great Yankees catcher Yogi Berra beckons in this 1963 ad. “Imagine a photo of your favorite Big League star hanging your picture in his locker,” the ad entices. No, you didn’t get to fly to NY to have your picture taken with Roger Maris or to Milwaukee to pose with Hank Aaron or even Los Angeles for a shutterbug session with Sandy Koufax. Sponsored by Acme Markets and a company called Picture Pal, your dream could come true just by sending your snapshot with a special label from any Acme Supreme bread and $1. Boys from Bayonne to Bayshore smiled eagerly for their Dads Brownie and made sure to ask Mom to get Acme Bread…top taste in every bite! 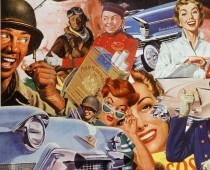 Way before Photoshop when you could create the same image in your very own home, this magic was achieved through old-fashioned cut and paste. With a dollop of rubber cement, your Kodak snapshot could be plastered on an 8″ x 10″ glossy made to look like you were hanging in your favorite big league baseball stars very own locker! Today in the post Penn State scandal era, some eyebrows might be raised, but in those more innocent times, what could possibly be wrong for a towel clad, beefy ball player hanging a picture of a gap toothed ten-year old boy in his locker? A nice, brief tribute to a seemingly huge baseball icon that will be missed by fans of the game. I didn’t personally know Yogi Berra, but his “public” persona seemed very charming, very apropos for his day and era. I haven’t followed baseball as a fanatical fan would/does either, or know all the famous funny quotes Yogi coined, but his passing seems to be a sad one, at least for America’s past-time sport. Rest in peace Sir. That closing line had nothing to do with Yogi Berra. As I mentioned this was a re-post of a previous article I had posted and the closing remarks were a commentary of changing perceptions, the idea of a beefy ball player hanging a photo of a pre-pubescent boy in his locker might might raise questionable accusations today . The “Boy’s Life” reference was in relation to that. But since I would like the focus to be more on Yogi today, I will remove that line so as to avoid any confusion. Ahh, my apologies Sally for my confusion. I missed that part about the re-post or forgot about it by the time I reached that last line’s interesting reference. Sorry. I know what you mean about “changing perceptions.” A school district I use to work for in the DFW area recently had a 9th grade student ‘arrested’, handcuffed, and hauled off to the local station for building an exceptional clock for his science project, which to some, primarily the teacher and principal, looked like a live bomb DESPITE his long-held character and grades in elementary and middle school; this could include his parent’s characters as well. Thank you for calling Yogi’s death to my attention. The passing of Yogi, Mickey Mantle, Ted Williams and others of that earlier era reminds us of how much baseball once meant to us. One of my favorite baseball stories is the opening chapter of Don Delila’s Underworld. It opens with the shot heard round the world when Bobby Thomson hit the ball into the stands for a three run homer off Ralph Branca and winning the National League pennant for the New York Giants over the Brooklyn Dodgers. Thanks again.